Sebago Furniture is proud to deliver several bed models, each handcrafted with elegance and life long craftsmanship. From the graceful rising curves of the Portland Palladium, to the exquisite construction of the Cape Neddick Mission, or the durable flexibility of the Maine Cottage, all of our beds are created with the beauty to keep you bedroom inviting for many generations to come. If you want to beautify your bedroom with one of our headboards, they can be ordered separately. 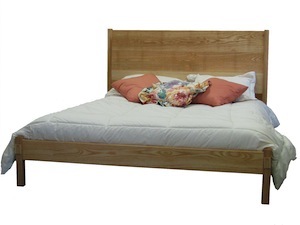 The headboards are designed to work with Sebago Furniture frames. If you would like to use a headboard with your own frame, we can provide an optional mounting board. Some assembly will be required. The Arch Bed (Copyright 2014) offers the unique design of a cantilevered bed that is supported by a pair of laminated curved arches on each side of the bed. The headboard gracefully slopes toward the back to support your back as you read that good book in bed. The footer is a firmly supported rail to show off the beauty of the headboard. The arches are secured to the side rails and are design to carry the weight. The footer rail and headboard are self aligning and secured by bed bolts under the tear drop covers. The mattress is firmly supported on a multi-section platform. The platform sections have handholds to allow for easy transport and assembly and they serve a secondary purpose for electric blanket wires or sleep control hoses. The finish is multiple coats of a blend of natural oils and topped with a buffed in beeswax finish coat. The mattress height is about 20" using a thin eight inch mattress as shown in the picture Other mattress sizes are possible). King beds have a center foot in the middle of the bed platform that provides additional support. 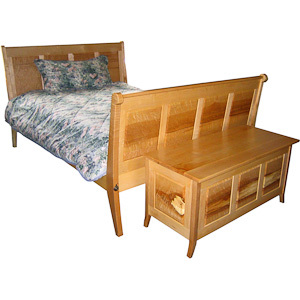 The bed as shown is a Queen size in Tiger Maple with Cherry spindles. 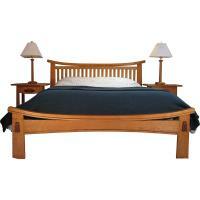 The price for the bed as shown with Tiger Maple frame and Cherry slats and arches is $4,820. Click on the image for other hi-res photos. The mission style bed shown here is done in Ash with a hand rubbed oil and wax finish that lets the beauty of the wood grain show. This finish produces a warm creamy glow to the wood.This bed can be ordered without the mission style footer. A Maine Cottage style footer can be substituted if a simpler look is desired. 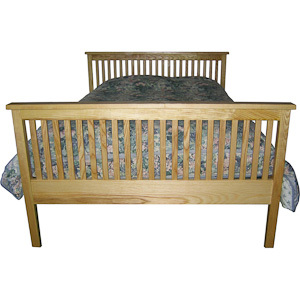 All beds come standard with a four-piece removable platform to hold the mattress. 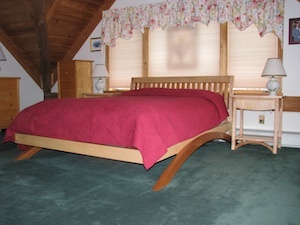 Optionally the Cape Neddick Bed can be ordered with a Maine Cottage style footer. 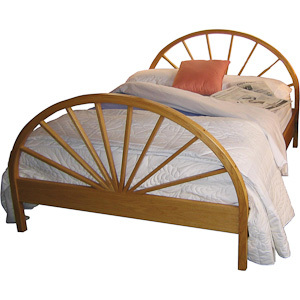 This finely crafted Palladian bed show here in Oak is made of a hand bent curved frame. Each spoke is hand fitted, and mortised into position to give the elegant radiance of a sunburst. Seeing the morning sun shining on this bed simply highlights its beauty and fine craftsmanship. The bed is straddled with matching nightstands.The picture shows the Portland style with a matching footer that is slightly lower in height. The bed does not require a box spring. Your mattress simply lies on the bed frame. The size of your mattress should fit in the bounds of the mattress area given below. If a box spring is desired the height of the platform can be adjusted. The header board is 44" high and the footer is 32". Optionally the Portland bed can be ordered without the Palladian footer and substituted with a Maine Cottage style footer.